The leaves of a tree are more than dangling appendages and shade providers; they perform photosynthesis to provide food for the tree and oxygen for wildlife and people. Leaves are also a key marker to identification between species of trees, with shape being the most significant factor. Trees with cordiform, or heart-shaped, leaves are some of the most easily recognized, and several common species are found in North America. Linden flowers are used in the fragrance industry. Most trees in the Cercis genus have heart-shaped leaves, such as eastern redbud (Cercis canadensis), a deciduous tree native to eastern and central North America and cultivated in U.S. Department of Agriculture plant hardiness zones 4 through 8. 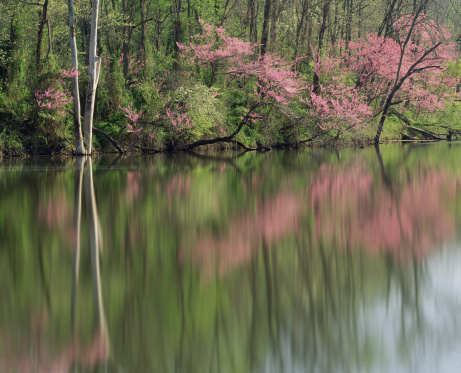 In early spring, before new leaves appear, its branches explode with clusters of pink blossoms that attract butterflies and other pollinators. Flowering is followed by the appearance of elongated seed pods and smooth, muted green to blue-green heart-shaped leaves that fade to greenish yellow in fall. Purple leaf eastern redbud, a cultivar suited to USDA zones 5 through 9 also known as 'Forest Pansy' (Cercis canadensis 'Forest Pansy'), features light green heart-shaped leaves that turn bronze or purple in fall. Western redbud (Cercis occidentalis), suitable for USDA zones 7 through 10, has similar characteristics to its eastern relatives, but its heart-shaped leaves turn red in the fall. 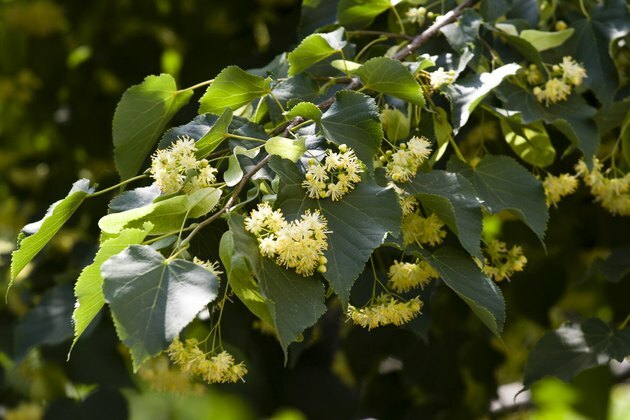 Also known as silver lime, the silver linden tree (Tilia tomentosa) is a deciduous species native to Eurasia and adapted to USDA zones 4 through 7. Because the large, serrated, heart-shaped leaves are dark green on top and silvery white underneath, they create a two-tone effect with the slightest breeze. While young trees have smooth, light gray bark, the bark of mature trees is bumpy and closer to brown in color. Fragrant pale yellow flower clusters appear in early summer and leaves turn yellow in fall. The foxglove tree (Paulownia tomentosa), also called empress tree, princess tree and royal paulownia, is native to China and cultivated in USDA zones 5 through 9, although it is also naturalized in the southeast. This deciduous tree sports very large heart-shaped leaves up to a foot long with a velvety texture and fragrant, drooping tube-shaped flowers of vibrant purple in mid-spring. Clusters of egg-shaped, green fruits emerge in summer, turn brown in winter and remain on the tree until the following spring. If you decide to introduce this ornamental species into your home landscape, be aware that it can become invasive due to a self-seeding habit. Also known as cigar tree, catawba and Indian bean tree, northern catalpa (Catalpa speciosa) is a North American deciduous species of tree with a natural range that includes USDA zones 4 through 8. It takes an average of seven years to flower, but after that large, white trumpet-shaped flowers appear each spring, followed by cigar-shaped seed pods. Giant heart-shaped leaves -- up to 12 inches long and 8 inches wide -- and a relatively fast growth rate make this species a popular shade tree in parks and along urban streets. What Trees Have Red Berries in the Summer?